PP by K&co (thanks Esther! 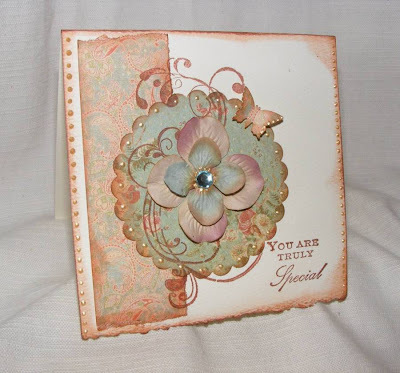 ), Prima flowers, Anna Griffin and Rhonna Farrer stamps, and some Pebeo Metal Touch and a crystal from stash. PP by Dianes Daughters, stamp by Anna Griffin, flowers by Prima, ribbon, staples and buttons from stash. ... in the style of mummy's cards!!! These were Luke's entry for this years Eisteddfod competition to decorate 6 biscuits. 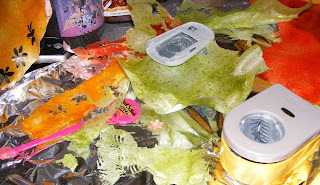 I discovered you can colour rice paper and punch it with my paper punches! FANTASTIC! Will be using that technique again! 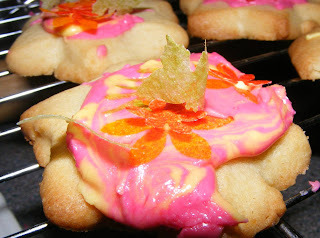 Also discovered how to make Royal icing... any way, enough about me, here are the biscuits, will let you know if he won anything with them next week. it tend to curl a little so I tore it into smaller sections to find flat bits. We are offering a fabulous RAK on SALT this week, please check it out and the other creations from the team. ...they could be women from the Bible, from Christian History or from your life. 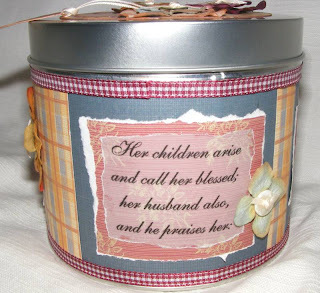 I kept with the mother's day theme, and have made an altered tin using the verses from Proverbs about a Woman of Noble character.. I'll be giving one to my mum and one to my mother-in-law. I was so blessed to have a Christian mother. 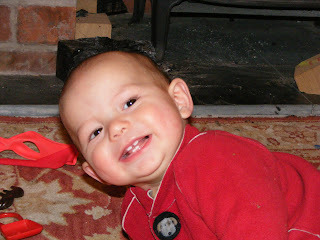 Her prayers for me and Christian values that were imparted to me have been fantastic. Although at times particularly as a teenager, we did not get on all the time (to put it mildly), she has always been devoted to all her 3 girls and to serving the Lord and sharing the Gospel with people around her. 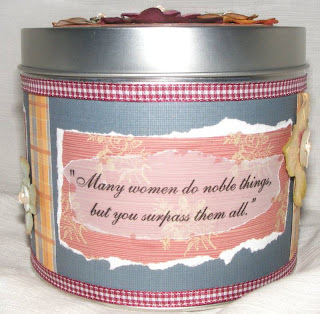 Her frugality and ability to make something from not-very-much is inspirational and has rubbed off on me a little! She truly is a woman of noble character to me! PP by Dianes Daughters, flowers by Prima, stamp, ribbon and bittons from stash. I love this weeks challenge! I have felt so guilty with the amount of waste plastic packaging that comes with craft products, and coincidently the card I made last week for Verve Visual had recycled plastic on it. So here is another one using the same Heidi Swapp packaging, I also used left over bits from my table that I found whilst tidying up! 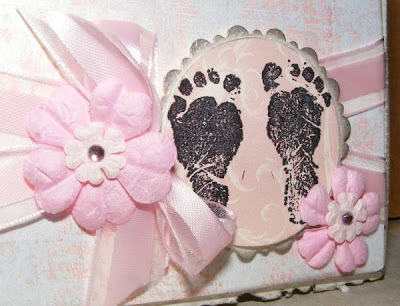 Plastic by Heidi Swapp, PP by Anna Griffin, Stamps by Stampin Up! 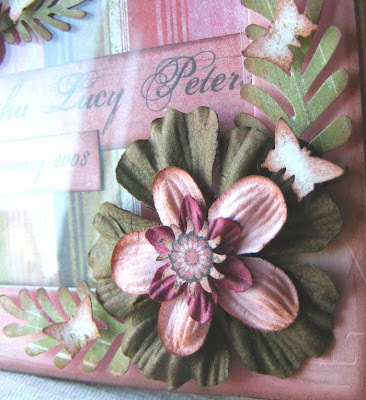 and unknown, corners by Quickutz, flowers by Prima, raffia, feather, flower punchies and crystal from stash. I've ended up with quite a few green Primas, great excuse to use them up! 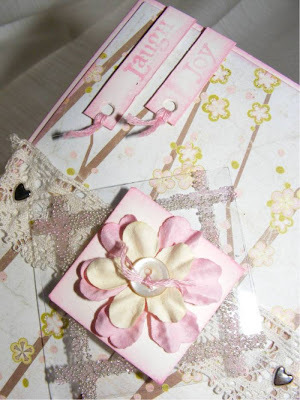 PP by TLC, flowers by Prima, stamps by Inkadinkado, All Night Media and RST. Ribbon and crytals from stash. 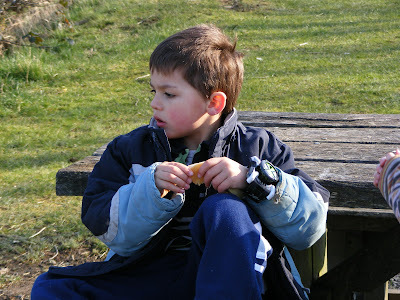 On Wednesday Stamper, the challenge is "Bookmarks" if I get chance I think I'll have another go. 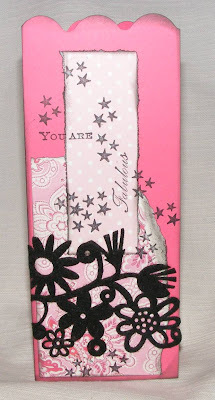 Below is my first attempt, I wanted to experiment stamping on clear plastic with Stazon, I then ended up sticking Pink card on the back sandwiching the black cord between it. This is for the midweek challenge from DCM , Juicy is the word! 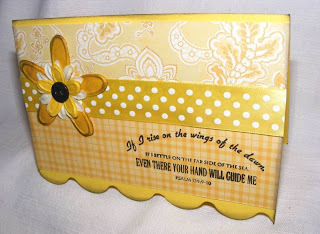 so here is my Lemon toned card accented with black. 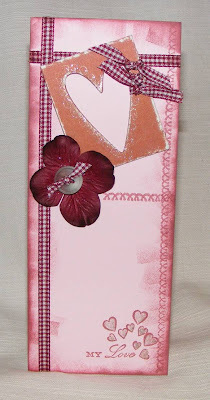 PP by Anna Griffin and HOTP, flowers by Prima, brad by HOTP, ribbon and stamp from stash. 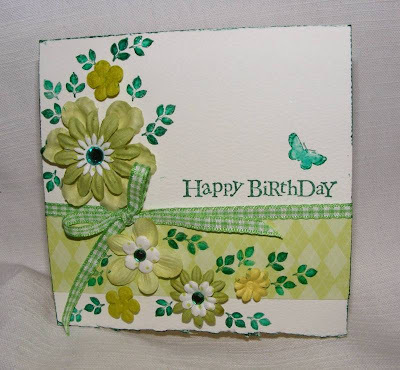 PP by Basic Grey, Stamps by Rubber Stampede and Anna Griffin, flower and ribbon from stash. 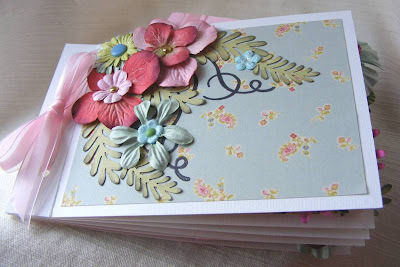 Finally got round to making a whole card with my Magnolia stamps, inspired by Tilda and Co to use some string, I also got wound to using these fabby little brads too! What do you think? 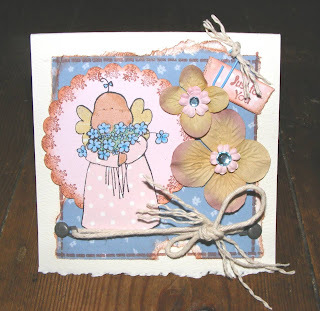 PP by Maria DeMarco, Basic Grey and HOTP, Flowers by Prima, Stamps by Magnolia, Rubber Stamp Tapestry, Hero Arts and HOTP. Brads, string, paper clip and crystal from stash. 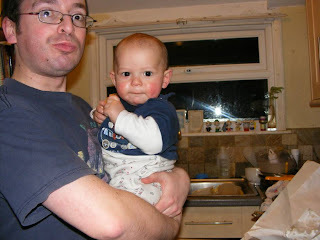 Tom was away at a conference this weekend so the boys and I stayed with a friend. 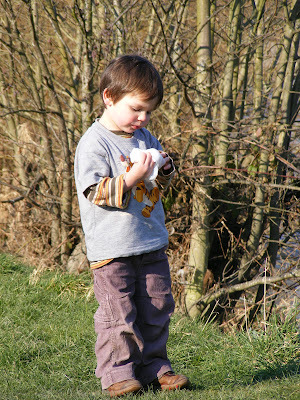 We went to feed the ducks and did some girly stuff like helping another friend make her wedding invitations. 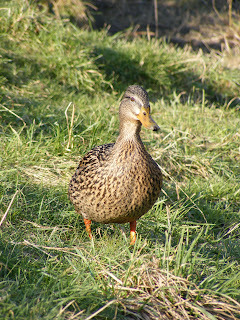 Got some nice pics of the boys to share... and a duck! 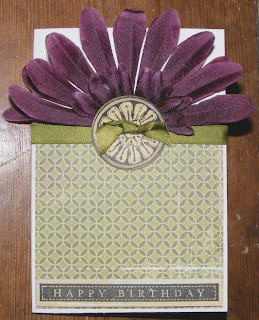 This card was inspired by sketch on Verve Visual's blog. I think it was meant to have more stamping than this for their competition, but hey ho, I enjoyed doing it, and loved recycling a piece of plastic packaging for the central embelly. PP by Basic Grey, stamps by Inkadinkado, flowers by Prima, plastic recycled Heidi Swapp packaging, button, lace, brads, thread and micro beads from stash. Ok, so I'm one of those Christians that has never practised Lent, although am happy to participate in lots of pancake and chocolate eating all through the year, never mind at particular times! So Lythan's challenge was a little tricky. However, the Lord brought to mind a message Andy Christofides preached at a conference I went to, where he said, if there is only one thing you remember from this message it is to... Read your Bible and Pray every day! Now I can't say I keep to this, but it certainly something I strive for. So I have created this hanging to remind myself, so rather than giving something up, I'm trying to adopt something, not just for now, but for always. 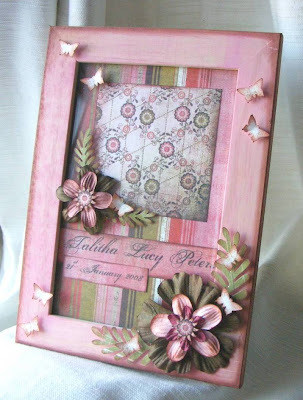 PP by Anna Griffin, flowers by Prima and Xcut punches, stamp by HOTP, feathers and thread from stash. 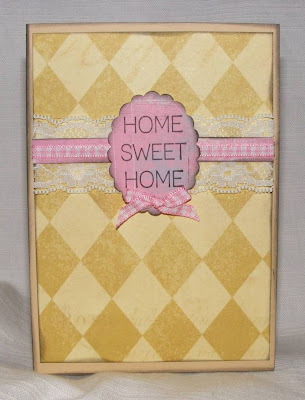 Inspired by Papertake Weekly's challenge of using stripes, I couldn't resist using these papers from Basic Grey to make an altered frame for another friend with a new baby girl! 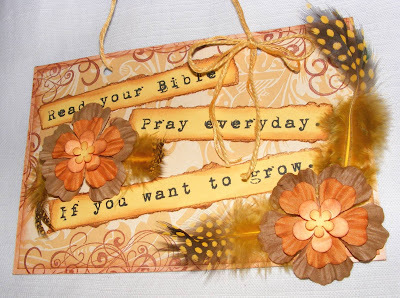 PP by Basic Grey, flowers by Prima, butterflly, sun and fern punches and Porcelain font. You know its valentines day soon, when most of the challenge sites are about love! What nicer thing could be celebrated? 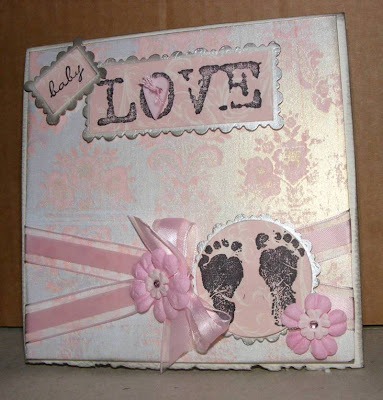 Here is my take on the Caardvarks theme, used it to make a card for a sweet couple who have had a baby girl. 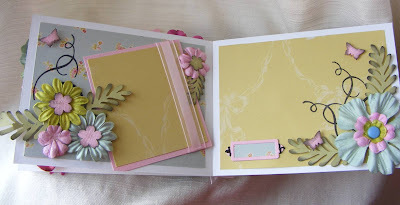 PP by Paper Mania, flowers by Prima, stamps by Stampin Up! 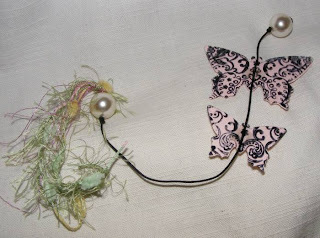 Hero Arts and Anitas, cloud scissors by Fiskars, button, crystal, ribbon and thread from stash. can I say goodbye to it? I love making things, but parting with them can be such sweet sorrow... but heyho, hopefully it will go to a good home! 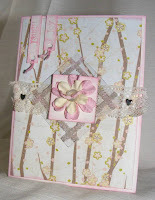 PP by Anna Griffin, CS by TLC, Stamps by HOTP, butterfly and flower punches, Prima flowers, Quickutz, Sakura glitter pen. 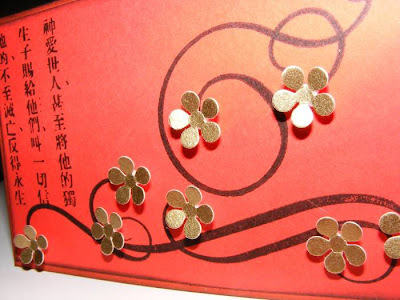 Happy New Year to all you Chinese folk! I'm guessing that the celebrations are the reason behind Wednesday Stamper's theme this week of ASIA. Rustled this up really quickly, I love it's simplicity and boldness. The chinese script is John 3v16 in Chinese. 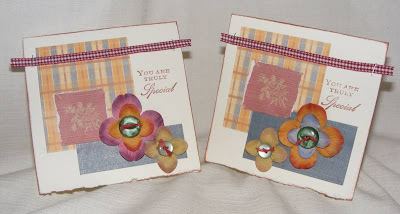 Stamps by Sweet Grass Stamps on ebay and HOTP, flower punch by Xcut. 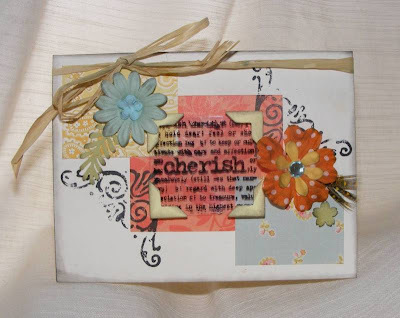 PP by TLC, Maria DeMarco, HOTP and others from stash. 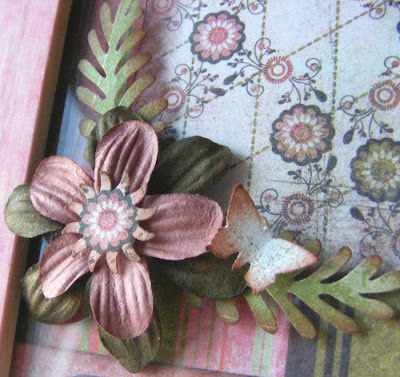 Stamps by HOTP, Anna Griffin and Autumn Leaves, flowers by Prima, crystal from stash. 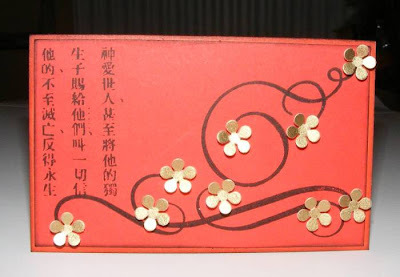 Another beautiful piece of work by ebay seller rainedakota, please click HERE for more pics! This week's CPS sketch was perfect for this card I needed to make for a friend. 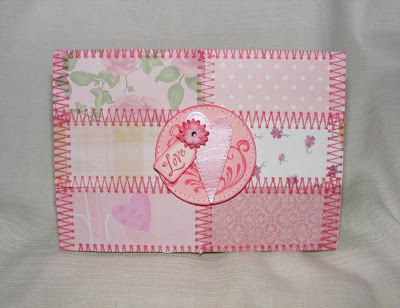 PP by Brenda Walton and Basic Grey, Stamp by Anitas, lace and ribbon from stash. Another challenge!!! This time from Pearl. To use Pink, Black and White on a card...easy peasy, I love this colour combo, excuse to crack open this gorgeous diecut felt from Queen and Co.
PP by Anna Griffin and Maria DeMarco, Felt from Queen and Co. Stamps by Anna Griffin and Hero Arts. Scallop scissors by Fiskars. 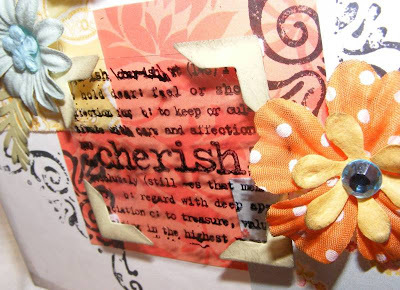 Chipboard by TLC, stamps by Anna Griffin, Hero Arts and HOTP, ribbon, flower and button from stash, Sakura glitter pen. 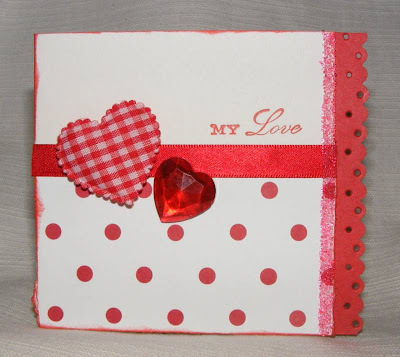 PP by TLC, stamp by Anna Griffin, scallop scissors by fiskars and holes made with MM setter. Ribbon and hearts from stash.